A quahog is so much more than a town where Family Guy takes place. 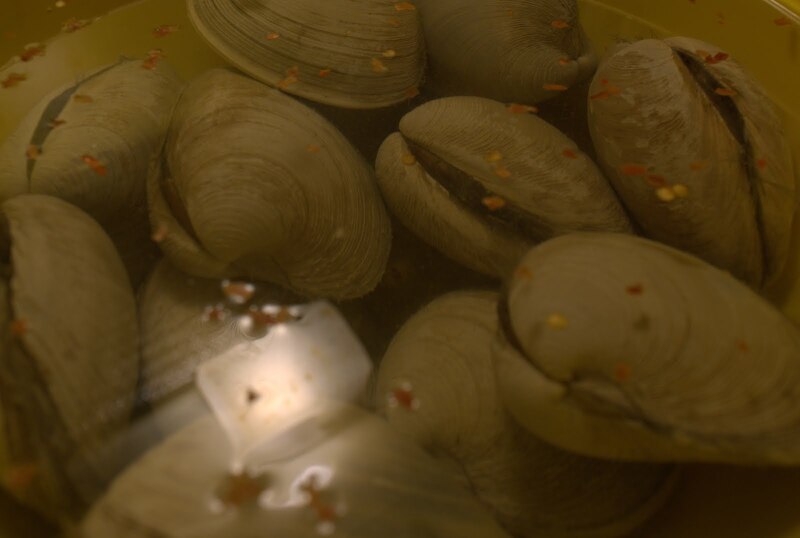 An actual quahog is also known as a chowder clam, but generally you recognize it as a large hard shell clam, larger than a cherrystone. Anywhere north of Boston, I find that you're going to have a little bit of a tough time sourcing quahogs, or people will simply refer to them as cherrystones. But honestly, cherrystones aren't big enough. It's really quite a mystery to me why I have such a hard time finding them on the North Shore. But that's what lead me to Gloucester. If your'e looking for any type of seafood, and can't seem to find it at your local fish store, your best bet is to call Intershell in Gloucester. After calling fish store after fish store on the North Shore, and having zero luck at locating the elusive quahog, one of my fish guys suggested calling Intershell. And a phone call later, an order was put in, and I would be able to pick them up on the weekend. 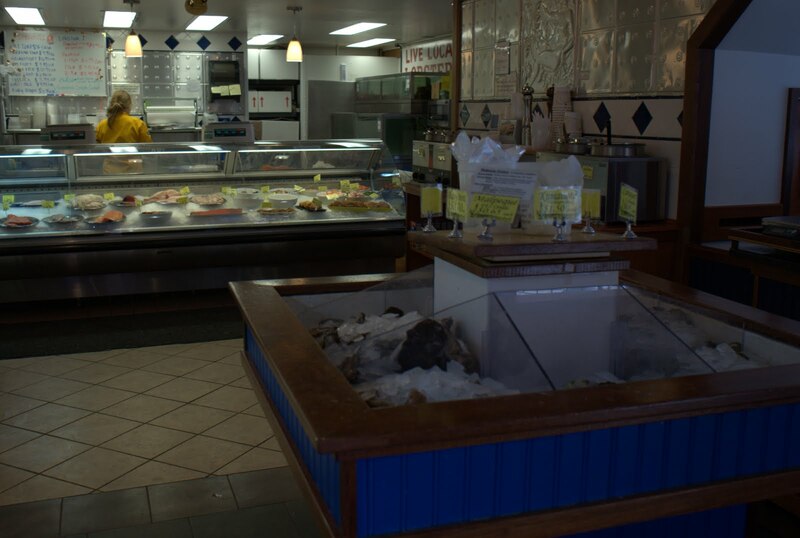 After spending a few minutes in the store perusing their lovely selection of dirt cheap oysters, and the haddock, tuna, scallops, and other local fish in the case, a young man popped in from the commercial building next door with a large bag of quahogs, per my order the other day. Quahogs in tow, plus a pound of scallops, and we were on our way. So what do you make with these huge clams? You make stuffies. That's what you make. 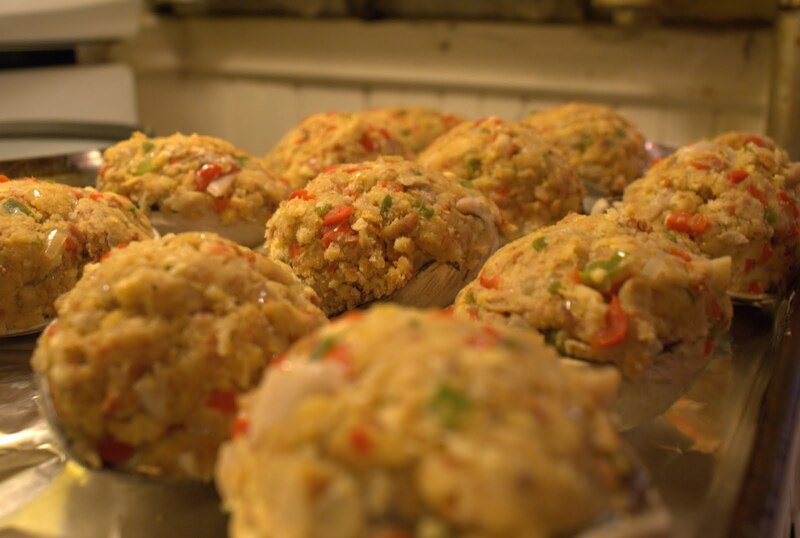 Stuffed quahogs are something that we all grew up with around Rhode Island, and cities like Fall River and New Bedford in Southern Massachusetts. They're delicious. 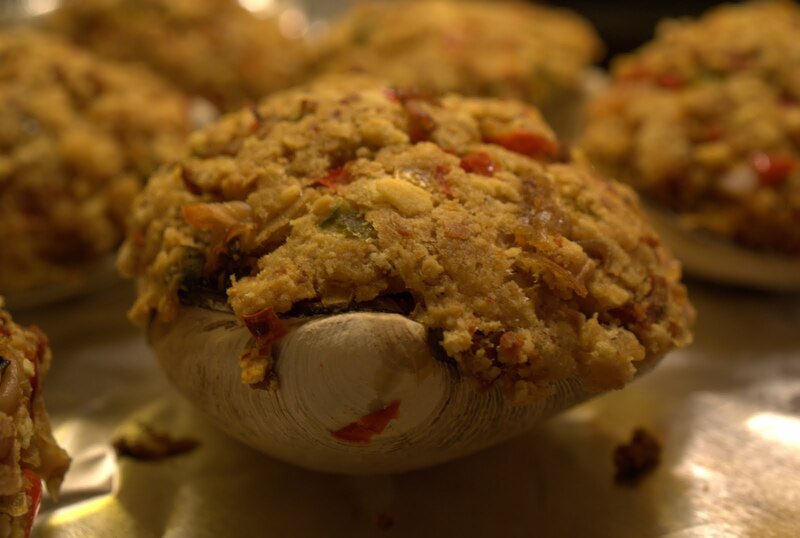 It's a rich clam stuffing, complete with Ritz crackers, peppers, onions and chouriço, that ultimately ends up stuffed back into a half shell, and baked until the top forms a crispy crust. It's eaten with ketchup and/or hot sauce. They're incredible, and one of those things that I crave after spending all too much time away from home. But odds are, if you haven't been here, you've never had one. So, for my good deed of the day, I'm about to disclose my family's favorite recipe for the stuffed quahog. Here we go. 1. Soak your clams with a bit of cornmeal and hot pepper flakes for about an hour. Though quahogs are usually pretty darn clean, it never hurts to try to get them to spit a bit more sand out. After they are sufficiently soaked, fill a large pot with about an inch and a half of water at the bottom, and insert a little steamer basket. Set the heat to high and wait for it to boil. Steam 10 quahogs until they have all opened, approximately 10 minutes should do the trick. Reserve the liquid. Chop up the meat roughly by hand. 2. Using small bowl of the processor, chop up 2/3 lb of chouriço... that should be approximately 1 1/2 sausages, if you're keeping score. 3. Chop 2 red bell peppers, and one green. Chop two small onions. Melt one stick of butter on low heat in a medium sauce pan. Throw in your chouriço, peppers, and onions and let the whole thing sweat until the onions are a bit soft. 4. Using a food processor, chop 2 tubes of Ritz crackers, 1 tube of saltines, and 6 day old torpedo rolls. Mix in 1 teaspoon of salt, and 1 1/2 teaspoons of pepper. 5. Combine all ingredients in a large mixing bowl. 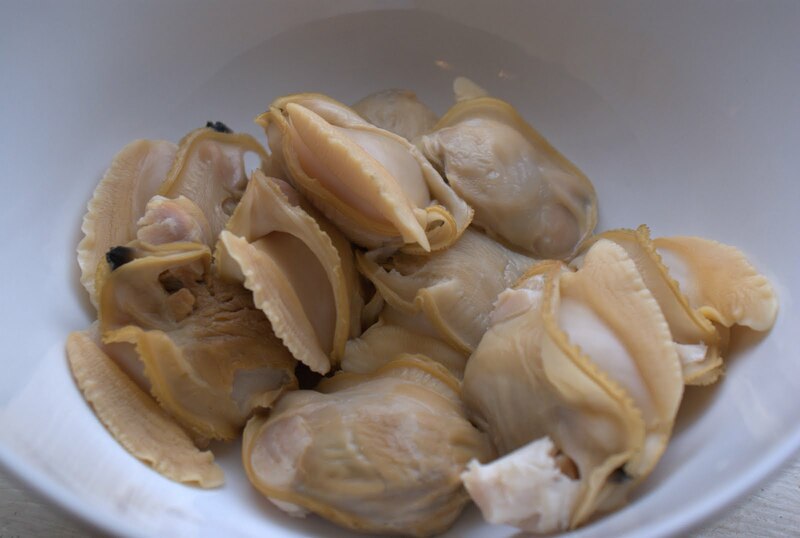 To moisten the stuffing, add a bit of the clam juice reserved from steaming the quahogs. You want the mixture to generally hold together, but not be mushy. 6. Now to stuff the shells. Take a half quahog shell, and mound about a half cup, maybe a little more, into each shell. Keep going until you have no more stuffing left to stuff, and load all of your shells, stuffing side up, of course, onto a baking sheet. Place into a 350 degree oven for about forty-five minutes to an hour, until you have a nice crust on the top. This is a real taste of home for me, but it's also not so strange or unusual a flavor, and therefore I'm pretty sure that anyone can appreciate a good stuffy. It's got that wonderful Thanksgiving stuffing consistency. 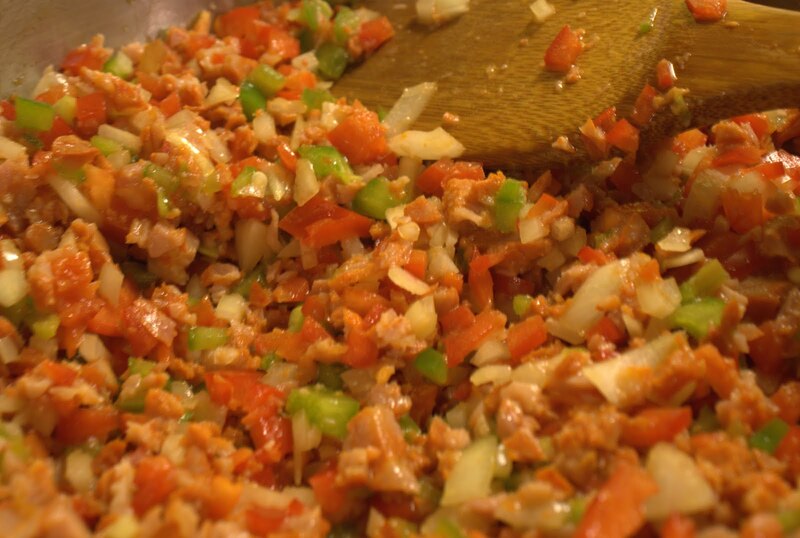 There are bits of clam throughout, as well as that delicious spiced flavor of the chopped chouriço and the beautiful color of all those peppers. If you're ever discussing native New England dishes, bring up the existence of stuffies, and that you know a recipe. You'll dazzle the pants off of anyone who has a similar love for foods that are quintessentially New England. Yes! I haven't been able to fall asleep and now I know why -- you had written my requested stuffies entry and I needed to read it!